Preface: I am extremely uncomfortable with fish. I don’t like the idea of them being close to me, touching me, nibbling on me or even looking at me. But the other night I decided to try to overcome my discomfort by getting a fish pedicure. The procedure is simple; a tank full of small, minnow-like fish swim around, lurking near the bottom of the tank in wait for their next victim. You “wash” your feet in a special bucket (which has been rumored to have been filled with water and a type of fish food), then stick them in the tank. Within a few seconds the fish flock to your legs and feet to nibble off the food and some of the dead skin cells as well. The ensuing feeling is probably one of the weirdest things I’ve ever experienced, and the first few minutes are basically my personal version of hell. It tickles and feels like bubbles are hitting your legs and feet, but the reality is that hundreds of little creatures are gnawing away at your (dead) flesh. The fish particularly like to dig in deep between the toes, and uncontrollable laughing and/or squealing generally follows. About five minutes later the discomfort subsides, and the twitching gets less and less frequent. It even begins to feel strange to not have the fish nibbling away at you; every now and again someone pulls their feet out of the water (either because their time is up or they temporarily can’t deal with being fish food) and the fish all retreat to a less tumultuous part of the tank, leaving you feeling startlingly unsatisfied. Fifteen minutes later we pulled our feet out of the tank and dried off our feet. We opted to get real foot massages from the same place, and were met with three very friendly staff members who were more than happy to deal with our fishy feet. I was surprised to be leaving content and relaxed, as I would have anticipated feeling complete terror and misery. After the initial pride at having been able to conquer the fish spa, I talked with several other people about the experience. 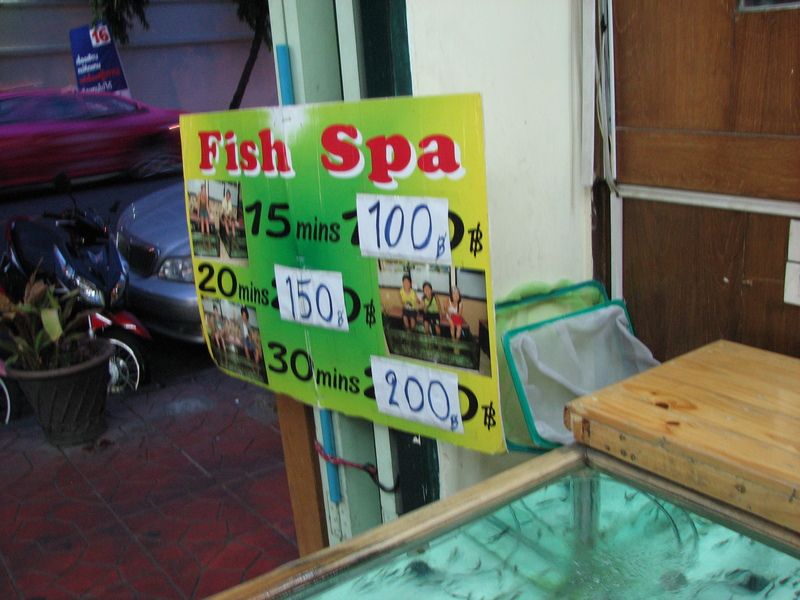 Although it hadn’t crossed my mind before, I was informed that these fish spas transfer all sorts of nasty aliments, from foot fungus to HIV (should an infected person have had an open sore that the fishies nibbled on). Although it was definitely a unique experience, going to a fish spa isn’t something I would recommend, especially after taking hygiene and safety into consideration. Thanks for the review, Natalie. I’ve been wanting to experience this, but when you said, “…these fish spas transfer all sorts of nasty aliments, from foot fungus to HIV…”, I was like, OMG that is so true! It had never crossed my mind. No problems! It was an interesting expeience to say the least, but after learning about how gross it can get… I dont think I’d really recommend it. Thanks for reading!